In a large bowl, whisk together flour, baking powder, baking soda and salt. Cut butter into dry ingredients with a pastry blender until the mixture resembles a coarse meal with some pea-sized pieces of butter. Gently mix in the goat cheese and chives, then stir in the milk until just barely combined. Dollop heaping spoonfuls of dough onto an ungreased baking sheet. Bake for about 12 minutes, or until golden brown. *smooches* Thanks Stephie! 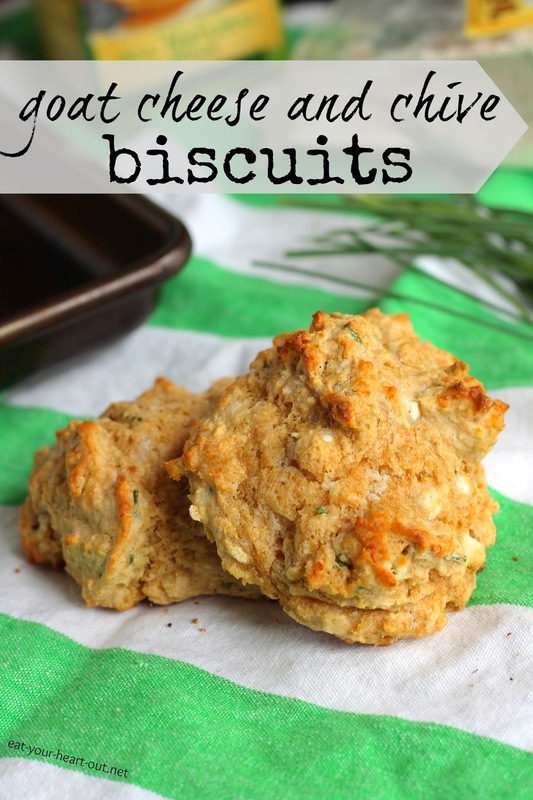 These biscuits look SOOOO GOOD! Soooo....you're making these when I stay with you, right? Don't forget to follow Eat Your Heart Out! !